Wherein we check out a few books by Starrett published just for libraries. The Complete Sherlock Holmes as I first saw it decades ago in the Carnegie Library. I was fortunate enough to find a copy in dust jacket many years later. I met Vincent Starrett one summer’s afternoon of the mid-1970s in the Carnegie Library of McKeesport, Pa. Shelved next to it was the library’s only other book about Holmes: The Private Life of Sherlock Holmes by Vincent Starrett. Purple. To this day, that's the first thought I have when I pull down a copy of this book. Ever since that first meeting 40 years ago, I’ve associated Starrett with libraries. 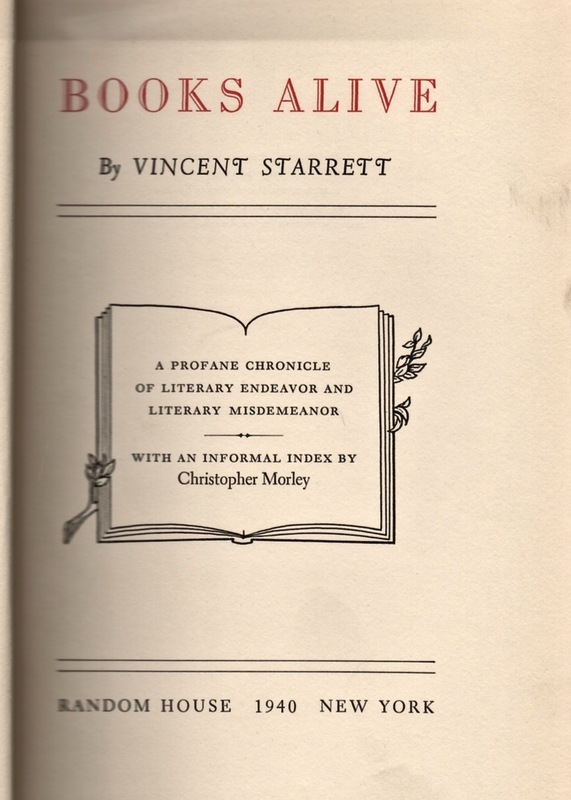 Oddly, although he wrote a lot about books, Starrett did not write much about libraries; but then he was too busy going from bookseller to bookseller in a quest to build his own private library, it’s possible that public libraries held little attraction for him. With so many of his own books at hand, why did he need public libraries, other than Chicago’s beloved Newberry? Libraries around the world have holdings of Starrett’s works, of course. But there are only a handful of Starrett’s books that have been reprinted specifically for use in libraries. We’ll pull a few of those off the shelves and see what they offer. The first point to make is that as a group, these are some of the dullest-looking books in my collection. Published for durability and not to attract the eye of a buyer, they often feature sturdy bindings with utilitarian covers and no dust jackets. They are to the originals what BICs are to fountain pens. Two of these books were copies of The Private Life of Sherlock Holmes (a.k.a. TPLOSH), both reissued in library bindings in 1971. Haskell House of New York, “Publishers of Scarce Scholarly Books,” had a niche market in the late 1960s through the early 1980s. With titles like T.E. Lawrence: A Bibliography, A History of Epic Poetry, and The Use of the Bible in Milton’s Prose, Haskell House produced hundreds of volumes, making access to these works easier for students and scholars in the pre-internet days. The books were either done in paperback or library bindings. As you can see, the Haskell House reprint of TPLOSH is a library binding with a basic dark green cover and title information on the spine. This is a reprint of the original, 1933 edition of TPLOSH, although Haskell House says it was first published in 1934. It's possible Haskell used the 1934, second pressing by Macmillan for its source. The good news is that the entire book is here, including the original illustrations. But there are problems, starting with the two-page acknowledgement by Starrett. Haskell House has published the pages out of order, with the second page of the acknowledgement first, followed by the first page. It's a bit confusing, to say the least. What’s worse is that the quality of the photographs had seriously degraded from the original to the reprint. Just compare the two versions of Dr. Joseph Bell’s photograph. The original is clean and crisp, which makes the good old surgeon a pleasure to view. The Haskell House reprint has flecks of white on the image and the inking leaves a lot to be desired. This was no doubt an inexpensive and quickly done job. AMS Press Inc. of New York also published an edition of TPLOSH in 1971. It appears AMS has a long history, having been founded as Abrahams Magazine Service, in the late 19th century. It appears to be still in business, having moved from 13th Street in Manhattan to Brooklyn, although the history page on its website has not been updated since 2006. Unlike the Haskell House edition, AMS did a reprint of the 1960 revised edition of TPLOSH, originally published by the University of Chicago Press. Like Haskell House, AMS was more interested in utility than aesthetics. Once again, the cover is blank, with the title information stamped on the spine. It appears that, except for an additional title page, AMS has scanned the pages of the 1960 edition for reproduction. It’s not as bad a print job as Haskell House, but there is still degradation in quality, especially in the illustrations. The very handsome dust jacket to the original edition of Books Alive. I like to think it's how Starrett was happiest: in a bookshop surrounded by walls of used books. One more before we close. By Haskell House or AMS standards, this library edition is positively elegant. Except for some changes to the original title page, the book faithfully reproduces the handsome original. Even the cover shows a little character, with both gold and deep red on the spine. Although it lacked the original's dust wrapper (which were, sadly, often discarded by libraries) this edition would have been a stately addition to any library's shelves. What would Starrett have thought of these editions? I imagine he would have had mixed emotions. After all, he was a man who loved beautifully appointed books. At the same time, he was almost desperate that his work be remembered, and keeping sturdy editions of his works in circulation kept his name before the public. 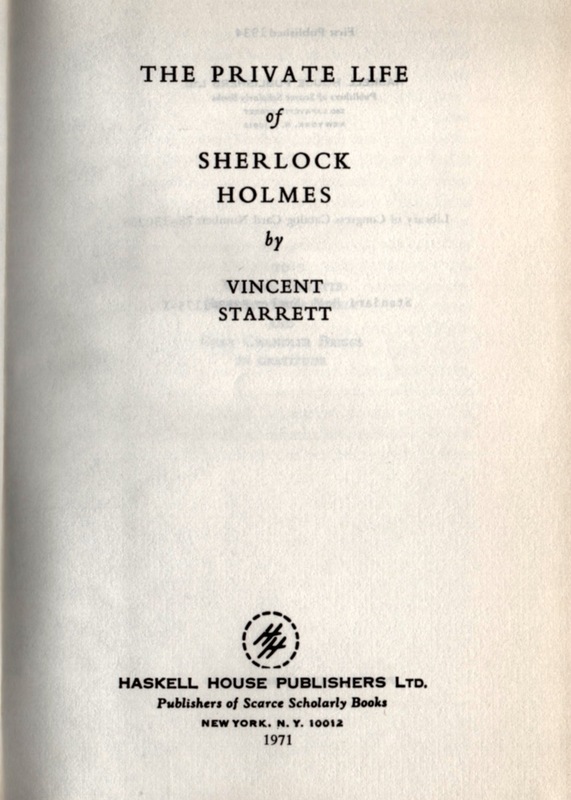 Starrett used that felicitous phrase to conclude the title chapter in The Private Life of Sherlock Holmes. It would later be adapted for used in his most famous poem, “221-B”. There is one more library edition that I’m aware of: Biblio and Tannen of New York did a reprint of 221B: Studies in Sherlock Holmes in 1969. I’m still hunting a copy that I like and can afford.